Civil Rights Movement: Freedom Rides and freedom riders. Chronology of the Freedom Rides From "The Freedom Ride" May 1961, Howard Zinn. The Freedom Ride of May 1961, Southern Regional Council Special Report (21-pages). The Freedom Ride and the Truman Walk, James Peck. Liberation, June 1961. The Freedom Rides: Were They in Vain? by Terry Sullivan, 1962. The Political Significance of the Freedom Rides by Tom Kahn, 1962. Demographic-Political Analysis of Freedom Riders, Henry Gerner, 1964. Freedom Riders 40th Reunion. Website devoted to the Freedom Riders of 1961. 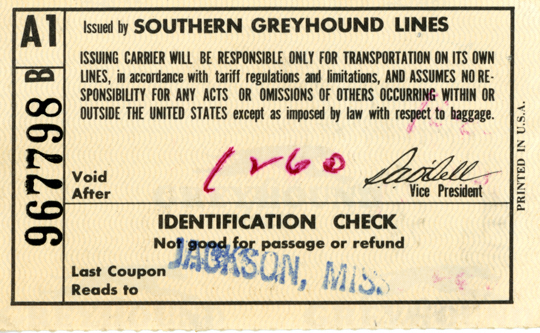 Freedom Rider Diary: Smuggled Notes From Parchman Prison, Carol Ruth Silver. University Press of Mississippi. Support flyers, Chicago. May 1961. Report of Meeting of May 26, 1961 (re Freedom Rides), James Wood, SCLC. Three Freedom Riders in Lynch Jail, CORE press release, November 10, 1961. Freedom Ride Travel Costs, Requisition Procedure, Wyatt T. Walker, James W. Wood, Freedom Ride Coordinating Committee. May 31. 1961. The map below is from an Associated Press article in February 1962. It accompanied a feature story on the Freedom Rides of 1961 and maps the rides referred to in the AP story. 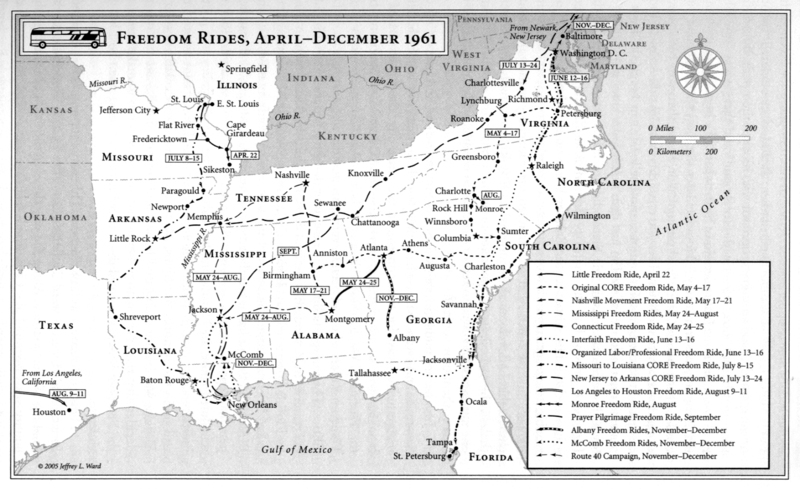 Note that the map shows only a few of the more than 60 Freedom Rides that criss-crossed the South between May and November of 1961.